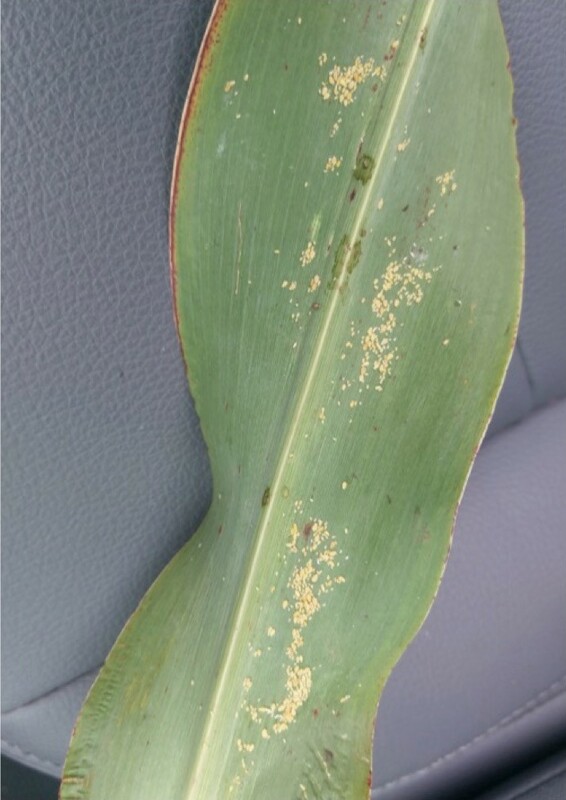 Sugarcane aphids are still present in sorghum fields examined over the last week but, like soybean aphids, seem not to have increased in densities or coverage. However, continued monitoring is prudent. 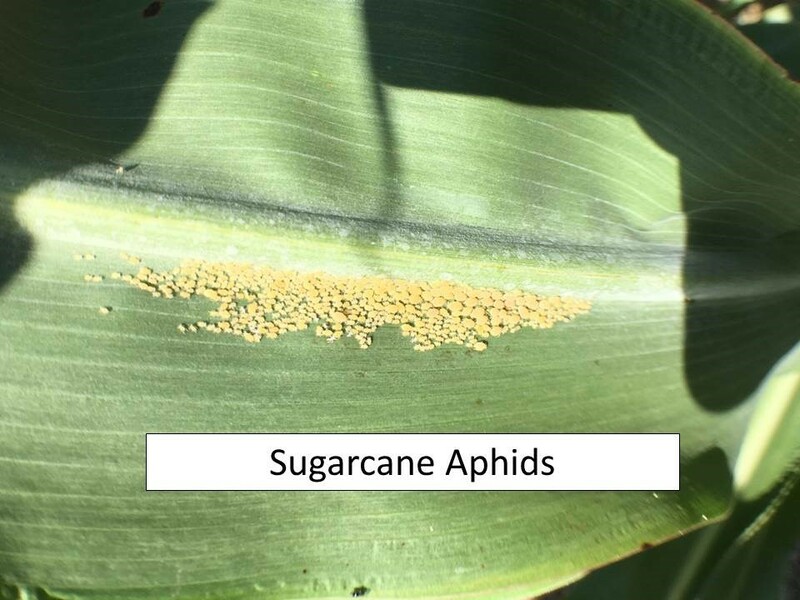 The sugarcane aphid (SCA) has been causing a range of harvesting problems in central Kansas. In some cases, sticky honeydew has been gumming up combines, sometimes bringing harvest to a halt, or slowing combine speeds. Fortunately, provided the grain has hardened, you can wait for a week or so and this honeydew will be weathered by the elements (and sooty mold) so that it is no longer sticky. The sooty mold that grows on it is not toxic, and so is not a concern for the cattle for those who plan to graze the stubble. However, palatability and nutritional value of the stubble may be somewhat reduced if aphid infestations have been heavy. 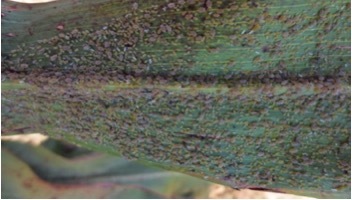 A more widespread problem is that aphid infestations in maturing panicles have caused uneven ripening of the grain, which in turn has caused uneven drying. Harvest has been delayed in some cases because grain moisture measurements in a field can be so variable that a decision to harvest is difficult to make. Back in late September, we observed a sudden cold snap in SW Kansas (overnight low = 39 deg F) that caused significant aphid mortality (Photos 1 & 2). City, KS, Sept. 28, 2016 (Sarah Zukoff). Dead aphids are black. Photo 2. Close-up of summer forms killed by cold shock (Sarah Zukoff). This suggested that large numbers of aphids might be killed by low temps that were still well above freezing. However, as day length shortens and temperatures get gradually cooler in the fall, we can see the aphids transition to a ‘winter phenotype’ with biology quite different from the pale yellow forms we see in summer. The aphids become much darker in color, slower to grow and reproduce, longer lived, and much more cold tolerant. This was evident in a field in Rooks County (thank you Cody Miller!) that had two successive freeze events last weekend (overnight lows were 23 and 26 deg F, respectively), and yet had remarkably high numbers of aphids still alive as harvest began on Tuesday. 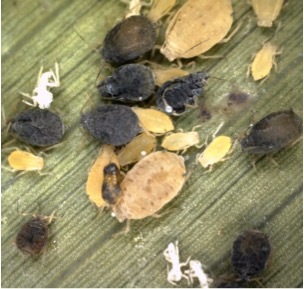 It is possible that aphids lower down within the crop canopy were buffered somewhat from the extreme lows, However, even though all the leaves were killed by the freeze, many aphids remained alive on the stems and in the leaf axials, with freeze-killed aphids appearing black and shriveled (Photos 3-5). County, KS, Nov. 15, and those that did not (black). (photos Ahmed Hassan). The winter phenotype of SCA is clearly adapted to survive short, sub-tropical winters by remaining alive on any green plant tissues or vegetative regrowth, as they have been doing in south Texas (Photo 6). Of course this will not happen in Kansas, so all the aphids will disappear once the plants are completely dead. Great variation in hybrid susceptibility to SCA has been evident in a number of performance tests this year, with many seed companies identifying one or more lines with substantial resistance and/or tolerance to these aphids. Farmers are should seek advice from seed company representatives on which of their hybrids have performed best under aphid pressure. 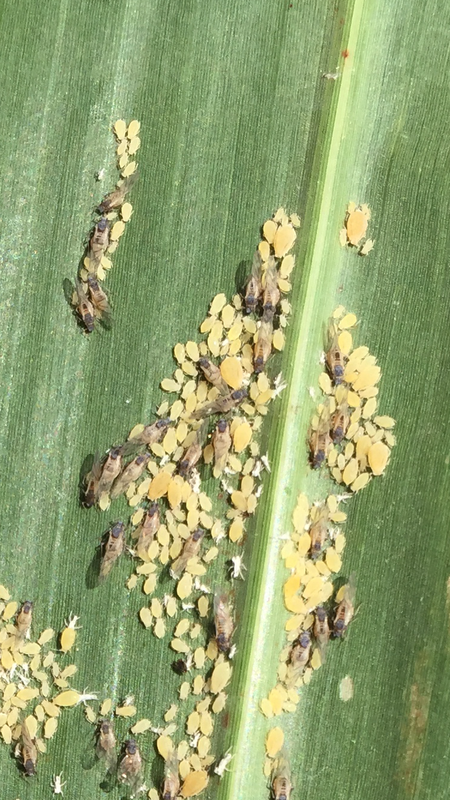 This week, Kansas received a section 18 approval for the use of Transform (sulfoxaflor) against sugarcane aphid for 2016, which will give sorghum growers two effective materials to manage aphid infestations. Note, there are differences in price between these two products, which should be factored into any treatment decisions, especially when multiple applications may be necessary. 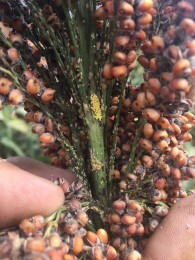 Recent reports have sorghum receiving insecticide treatments for relatively light populations of sugarcane in south Texas, but the aphid is beginning to slowly move north, so the potential exists for much earlier infestation of Kansas sorghum this year. 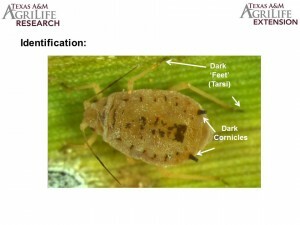 There are also confirmed reports that the aphid overwintered on Johnsongrass rhizomes just north of Lubbock, TX. This is about about 80 miles further north than in 2015. Reports from Texas indicate some of the cultivars rated as resistant seem to be holding up well, probably with the assistance of good natural enemy populations. The Sorghum Checkoff has a list of ‘tolerant’ (= resistant) hybrids, but it does not indicate any regional adaptations for the hybrids. 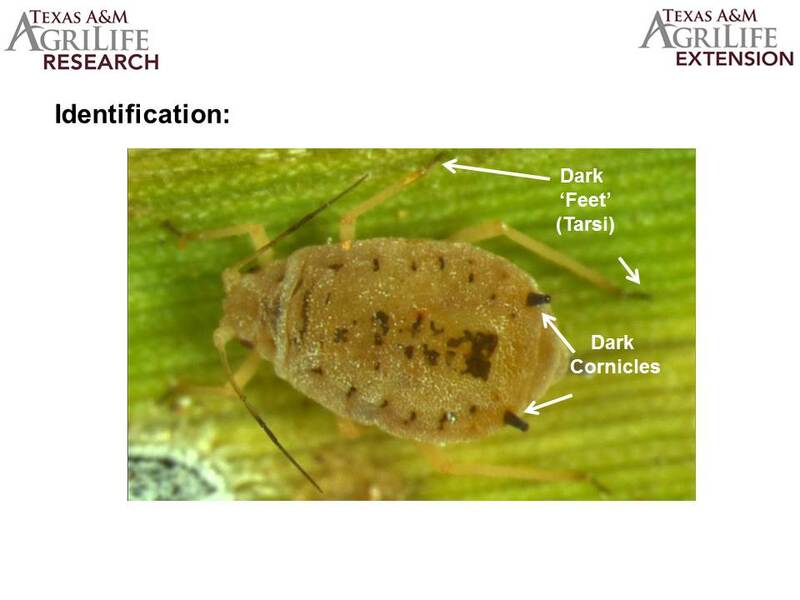 We have not yet ranked Kansas-adapted hybrids for resistance to sugarcane aphid, but efforts are underway to evaluate hybrids this summer. We strongly recommend that growers and extension agents contact their local entomology specialists for advice, as management recommendations will vary regionally. Scout early, scout often, and know before you spray! Plant as early as possible to give plants a head start on the aphids, which tend to arrive later in the growing season. Currently, the insecticide Sivanto (Bayer) is the only chemical labeled for Kansas sorghum for managing sugarcane aphid infestations. Last season in 2015, Kansas had a Section 18 approval for the insecticide Transform (Dow), and although a 2016 Section 18 has been requested, this has yet to be approved for Oklahoma or Kansas. Efforts are underway to screen hybrids for resistance to SCA, but few are being sold as resistant so far. However, data collected so far suggests that a number of varieties rated as resistant to greenbugs also express resistance to SCA – but not all of them. Farmers can expect SCA to arrive in Kansas as early as July, depending on weather conditions and wind direction. 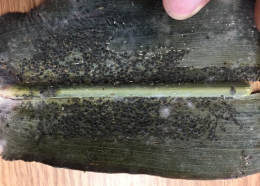 Be sure to monitor the spread of the aphids northward migration via updates from this blog, county agent updates, and twitter.